Last week began with Binance at the top of the ranking. On June 18 it registered a trading volume of $1.2 billion. Hong Kong-based OKEx trailed behind with a volume of $1.04 billion. The week came to an end with OKEx in the lead with a volume of $1.40 billion. Over the course of the week, Binance lead the ranking for four days while OKEx took the pole position three times. 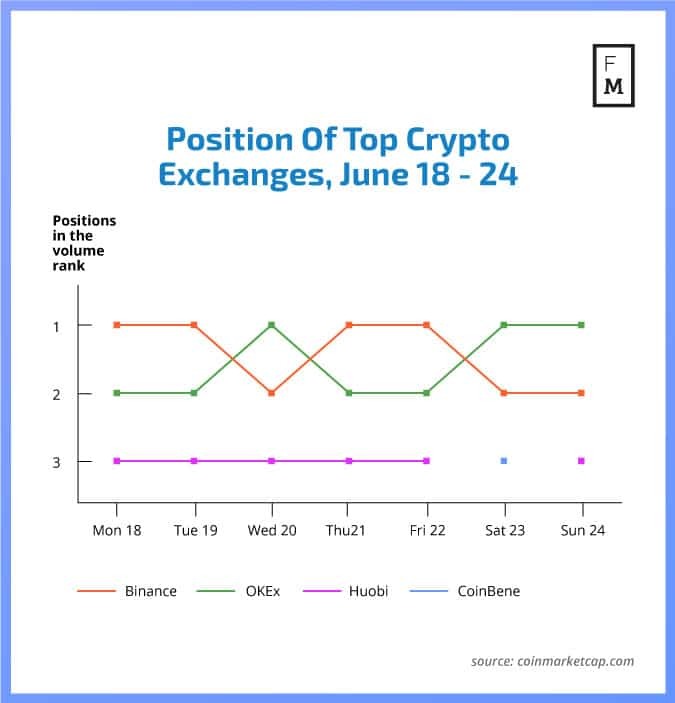 As for the remaining places among the top crypto exchanges, Huobi showed the most stable performance, spending almost the entire week in third place. It was overtaken only once on June 23 by CoinBene which unexpectedly jumped into third place with a daily volume of $0.62 billion. On a side note, CoinBene is an interesting venue to look at as it has recently been rising through the ranks. 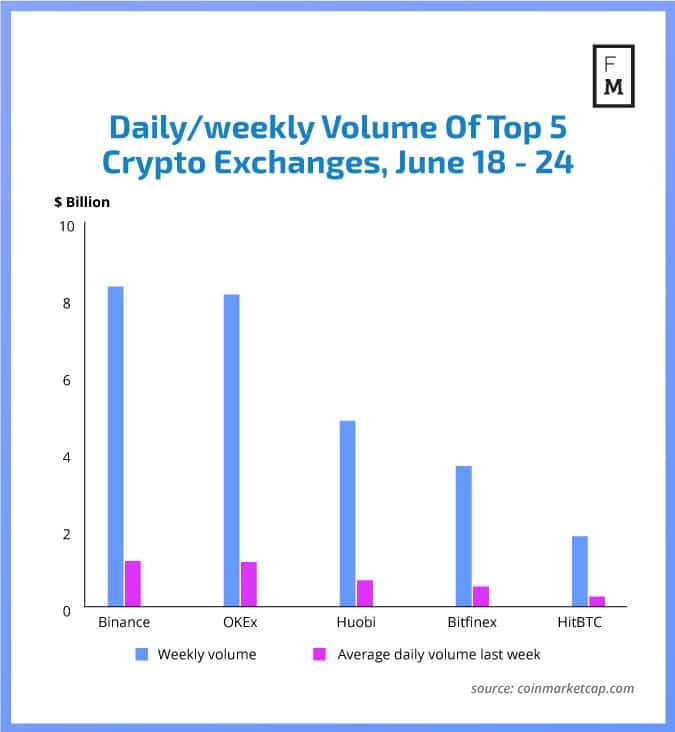 Despite OKEx closing the week with the highest daily volume, it was Binance that had the largest cumulative volume for the whole week. Binance reached a combined weekly volume of $8.31 billion compared to OKEx’s $8.10 billion. No other crypto exchange had a volume over $5 billion. Finance Magnates recently reported that Binance signed a memorandum of understanding with an industry organization on the island of Jersey. According to the official press release, Binance will be opening an exchange on the island. The two parties will engage in a mutually-beneficial collaboration in which Binance will help Digital Jersey to develop the blockchain infrastructure of British dependency. This has been the latest publication from the Finance Magnates Intelligence Department. In today’s business world, big-data analysis and access to objective information sources are crucial to success. Unfortunately, until now, it has been challenging and costly, if possible at all, to find any reliable benchmarks for operations in social, FX, Cryptocurrency, and CFDs trading. For this reason, the Finance Magnates Intelligence Department has launched a new project, creating a set of analyses covering various aspects of the cryptocurrency trading industry. These will provide you with unique data points gathered by our analysts, that will serve as a valuable knowledge base for your decision making.